The Wakefield Tricycle Company was founded by Ken Chubb and Shirley Barrie in 1972, presenting plays which had never been produced in London at lunchtime in the back room of the Pindar of Wakefield Pub in King’s Cross, London, England. After two years it began touring rock musical revues on current social issues to local community and youth centres, and to colleges and universities. Before long the Company was commissioning new plays which it presented at arts centres around the country and then brought in to small London theatres such as The Bush and the King’s Head. In 1980 the Company was given a lease on an old music and dance hall in the Kilburn High Road and opened the Tricycle Theatre. In 1984 Ken and Shirley turned the Tricycle over to artistic director, Nicolas Kent, and administrator, Mary Lauder. Indhu Rubasingham took over as artistic director in May of 2012. The theatre is created from modern scaffolding but is modelled on the Georgian Courtyard Theatre in Richmond, Yorkshire. The primary considerations were intimacy, the connection between the performers and the audience, and a departure from the black box that had dominated theatre for years. The design by architect Tim Foster and theatre consultant Iain Mackintosh, was such a success that in 1987, when the theatre was gutted by a fire which started in an adjoining timber yard, the rebuilding recreated the original design. The unstoppable Tricycle presents a full programme of it’s own productions and those of selected visiting companies. It offers a wide ranging programme of performances and workshops for children, sponsors a thriving youth theatre, and has an art gallery. The theatre was awarded a 2.5 million pound lottery grant and in the autumn of 1998, opened a new 300 seat cinema. There is also a new scene workshop, a rehearsal hall, The Paintbox – for the visual arts, and a playground. In 2006 the theatre received a Special Award for its pioneering political work at the Evening Standard Theatre Awards. 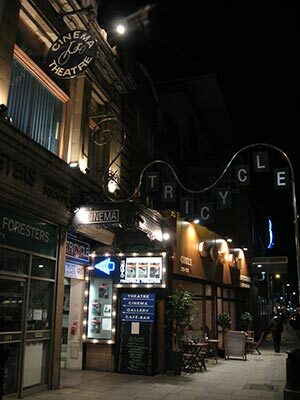 Tales of the Tricycle Theatre, by Terry Stoller was published by Bloomsbury Methuen Drama in 2013, and provides an inside look at the history of the theatre.